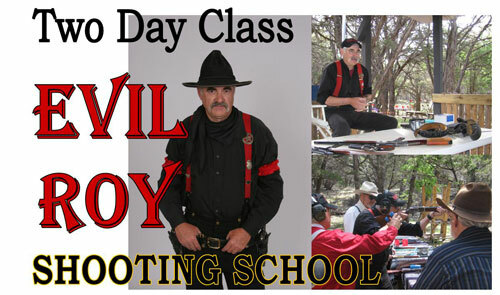 Evil Roy, a past World Champion, current National Wild Bunch Champion and Silver Senior Cowboy Action Champion and trainer for many other World Champions, will be in central Texas Memorial Day Weekend to share his insights, skills, and tricks of the trade that can make you a better shooter. This 2-day school on Saturday the 28th and Sunday the 29th will teach you how to be a smarter and better shooter. This is the same school offered at Winter Range but it’s now available in Central Texas. Some of the best shooters in the world have taken this class to improve their shooting, transitions, and stage management. Even if you don’t want to be a world champion contender, you can learn a lot of tricks and techniques that will improve your game and increase your shooting enjoyment. Has your shooting plateaued? Want to move to the next level? Evil Roy’s school can give you tips and procedures that can help you shave seconds and misses from your time. Evil Roy is making a special trip to host this school and the organizer, The Tejas Caballeros, need to get a minimum of 20 shooters enrolled to make this happen. Take advantage of this opportunity to get a world-class cowboy action education with hands-on training close to home from one of the premier teachers in our sport. The price per person for the 2-day school is $250.00. Additional immediate family members are $150.00 and SASS juniors shoot free with a paid adult. Payment terms are cash, Visa, or Master Card. Make direct contact with the school through Wicked Felina (aka Karen Pearcey) to register and pay your fees.